Hepatitis B is prevalent in 1 in 10 Asian Americans. Because of the silent (virus carriers are asymptomatic) and deadly nature of the virus (1 in 4 virus carriers will be diagnosed with liver cancer), it is important to spread awareness about the what can be done to community members. 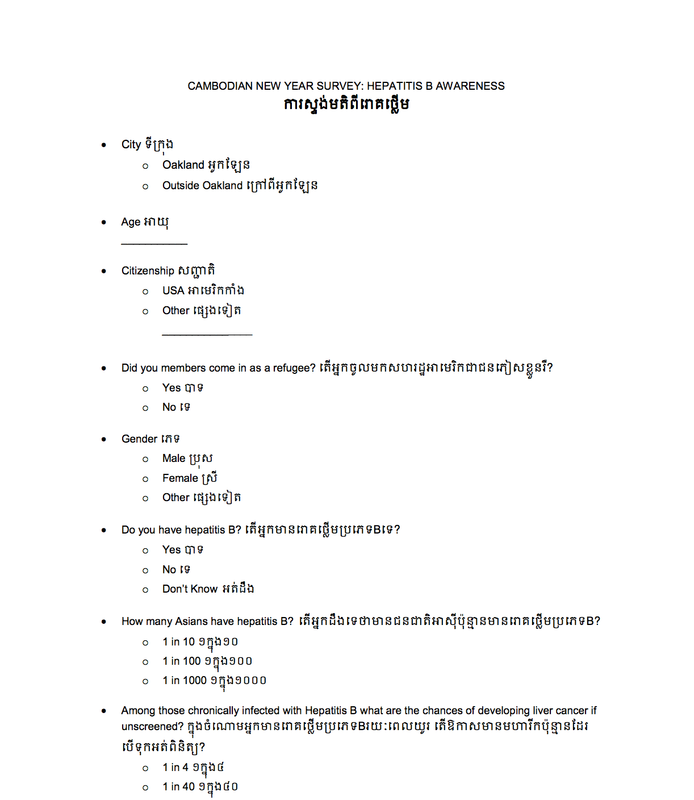 For this project, I created a survey, and had it translated into Khmer. 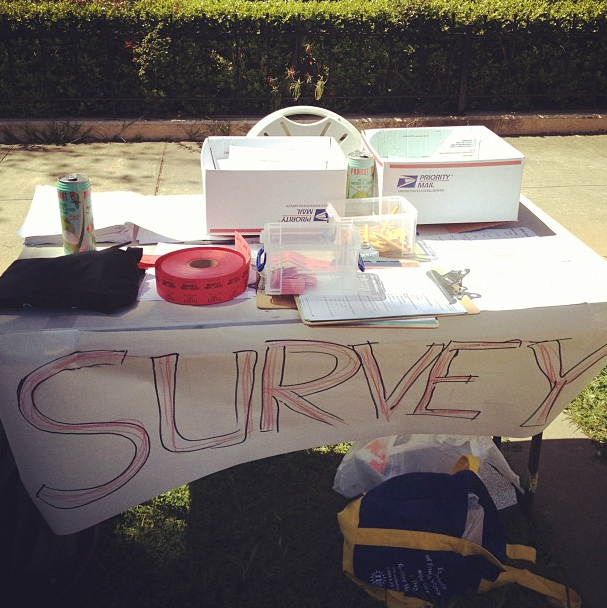 I also trained 10-15 high school students on how to survey community members for this event. We managed to gather information on 100 participants at this event. The importance of wording questions from English to Khmer: there was confusion on what exactly Hepatitis B was because some misunderstood it to be liver cancer. This was challenging because there was little knowledge in the community of what a virus was. This issue could be addressed in the future with a more detailed script of what Hepatitis B is, and selling the idea that prevention is easy and very much worth it. 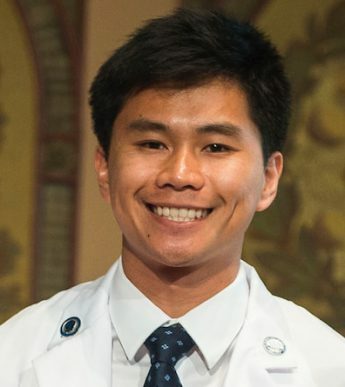 More importantly, since many Cambodians were screened for Hepatitis B as refugees through the CDC upon entry to United States, it’s important for Cambodian Americans to manage their Hepatitis B status with regular screenings. This item could have been addressed in the survey through asking subjects if they have regular check ups with a primary care physician or receive blood tests every 6 months to manage conditions. Seeking to understand what are the most pressing problems for members of the community: Someone was actually robbed at gunpoint at this event. As a researcher and someone trying to partner with the community, it’s important to realize that health and doing what the CDC/AMA/AHA/ADA recommends is not necessarily a priority for members of the community. This is something that I’m still and will be learning about in serving the community. The difficulty of building rapport when you’re likely not going to see the person you met ever again. Which is why whatever we tell members of the community, that it’s something that is useful, empowering, and teachable to family and friends. Although it was tempting to illicit fear with this outreach event, I know it’s not effective in the long term and can affect perceptions of “health researchers” in the future.